Season Two of drama Wentworth will begin on May 20th on Foxtel. The show was the toast of the ASTRA Awards last night with two awards as Most Outstanding Drama and Most Outstanding Actress (Nicole da Silva). 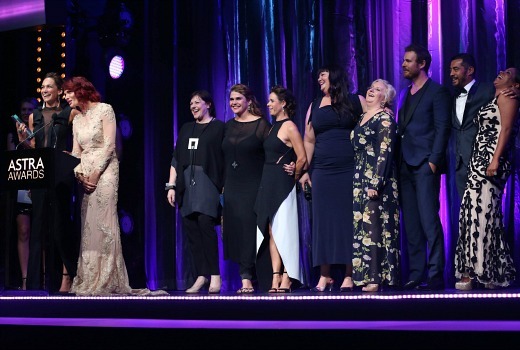 The cast were having a ball with da Silva and Danielle Carter accepting awards while jokingly referring to one another as Amanda Crittenden (Series Producer) and Jo Porter (FremantleMedia Head of Drama) -both were laughing in amusement behind them. Meanwhile Season Three began rehearsing earlier this week with shooting set to get underway next Monday. For season two, the Wentworth story picks up three months after Bea Smith (Danielle Cormack) killed Jacs Holt. Liz Birdsworth (Celia Ireland), Doreen Anderson (Shareena Clanton) and Sue ‘Boomer’ Jenkins (Katrina Milosevic) are still serving time, and while Bea has been languishing in the slot, Franky Doyle (Nicole da Silva) has risen to the position of top dog unopposed. The sudden arrival of new Governor Joan Ferguson (Pamela Rabe) is about to change all that. Ferguson’s mandate is to clean up Wentworth and restore order at any cost to the inmates and her staff – Deputy Governor Vera Bennett (Kate Atkinson) and Corrections Officers Matthew ‘Fletch’ Fletcher (Aaron Jeffery) and Will Jackson (Robbie Magasiva). any body have a link to the trailer? Just saw the promo for season two. My stars has The Freak been perfectly cast!